Following the river Loire is one of France's most interesting and diverse cycle routes. John Higginson, author of original Cycling the River Loire, has this introduction to the bike route. 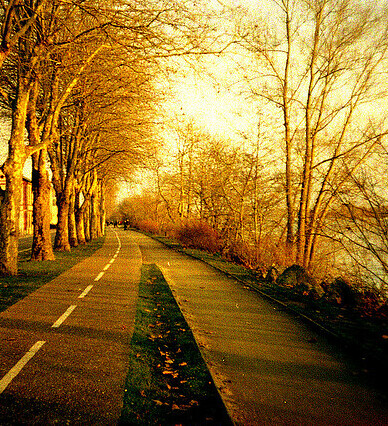 Autumn near Couëron, on the banks of the Loire, west of Nantes – perfect for cycling in France. Imagine a cycle route in France which takes in some of the most spectacular mountain scenery, long days of gentle bike riding through idyllic rustic scenery, and the chance to visit the most mind-boggling chateaux in the world alongside miles of vineyards. You’ve got it! You’re cycling in the Loire Valley. There are cycle routes all over the Pays de la Loire and Centre regions, and the wonderful €52 million Loire à vélo – a trans-regional bike route that crosses two regions, six départements and six major urban areas – is the centrepiece. The Loire bike route, which starts at the Atlantic, is one of 12 cycle routes that make up the EuroVélo 6 cycleway, a European Federation of Cyclists (EFC) initiative that crosses 10 countries (France, Switzerland, Germany, Austria, Slovakia, Hungary, Serbia, Croatia, Bulgaria and Romania). For specific bike routes that follow the entire length of the river Loire, see our section guides that cover cycling from Gerbier de Jonc to Le Puy en Velay; riding from Le Puy en Velay to Sancerre; and pedalling Sancerre to St Nazaire. As with many areas of France, the best weather for cycling the Loire is spring and/or autumn, although expect snow as late as April and as early as November. The roads are never going to be busy for cyclists (some would say they are deserted), except for the honey pots of the chateau country. Because the source of the Loire is at an altitude of 1,550 metres, its approach by bike needs to be well planned. The simplest method for cyclists arriving from the UK is to take the European Bike Express to Orange. From Orange, either climb the Ardèche Gorge to Vals les Bains and then to le Gerbier de Jonc, or give yourself a couple of days' acclimatisation by riding through the Chateauneuf du Pape vineyards before tackling the climb to the Loire’s source. For possible rail-cycle routes, see OUI.sncf. See also our information on taking bikes on French trains. La Loire à Vélo also carries transport information for cyclists. Accommodation for cyclists in the Loire should not be a problem during the summer months, although do not expect the Ritz. If you’re cycling the whole length of the Loire, the cost of overnight accommodation needs to be taken seriously. My wife and I, who are both approaching 70, find that gîtes d’étapes are perfectly adequate, if sometimes few and far between. These are simple but clean and often run by the local mairie (town hall/mayor’s office). Some provide meals but almost all provide kitchens and showers. If you intend to cycle camp (see our cycle camping in France article), buy yourself a good up-to-date guide – the Michelin and Alan Rogers guides are both reliable – and don’t be afraid to telephone ahead. Sites such as Parc de Fierbois, 30-odd kilometres south of Tours, are a good option for families and group of cyclists, with regular tent pitches available as well as chalets, gîtes and even treehouses. Chambres d’hôtes (B&B) and tables d’hôtes (B&B and evening meal) are plentiful and Ferme Auberges are available in rural areas and well suited to cyclists; they provide mounds of fresh food but may not provide overnight facilities. Search engines such as booking.com can be useful in throwing up affordable options in the larger towns and cities like Nantes. The Loire Valley Tourism website has lots of accommodation options, too. Zoom in on our map below to see bike-friendly places to stay on our own database, or search our Where to stay section. The Loire is one of France's most popular regions for organised cycling holidays. Many companies offer organised rides in the Loire that usually include accommodation, detailed route notes and maps and on-ground support and advice. They are mostly self-guided, offering you a mix of both independence and local support. Bike hire can also be arranged by most tour companies. You can search our organised tours section here. The road surfaces in the Loire – as in most of France – are generally very good for cycling. French roads are narrow but very quiet and French drivers are courteous and give cyclists plenty of room and a toot of the horn when overtaking. Take inner tubes, a tyre, spokes (different size in France) and a comprehensive tool kit in waterproof panniers. This may seem over the top, but cycle shops can be sparse – some up to 300 kilometres apart, which is a long way to push your bicycle. If you do suffer a puncture, check the inside of the tyre and put in a new tube; it saves time and you can mend your old tube at leisure. Most of the bike route between the source and Orléans has a dearth of cycle shops or cycle hire facilities. For detailed cycle route information and maps, see Cycling the River Loire. L'intégrale de la Loire à vélo de Nevers à la mer is now also available in English (The Complete Loire à Vélo Trail from Nevers to the Atlantic). There is also Richard Peace’s Cycling Southern France: Loire to Mediterranean. More general overviews include the Footprint guide to the Loire Valley and the DK Eyewitness travel guide. The Loire: A Cultural History by Martin Garrett is also an interesting backgrounder. For the Loire Chateaux area, there are plenty of beautifully illustrated books which tend to be heavy – remember, whatever you buy, apart from food, you have to carry, so it’s probably best to use them for inspiration and route-planning prior to departure; they include Chateaux of the Loire Valley. See also our article on the top 10 Loire chateaux to see by bike. The IGN maps are perfectly adequate for the bike journey, and most towns en route have localised maps available from tourist information offices that are useful for cyclists. The La Loire à Vélo website has an excellent, interactive, section-by-section map of the bike route from Saint Nazaire (which has a ferry link to England) to near Nevers. John Higginson, a keen cyclist in his youth, took up cycling again after retiring from teaching. He is now a professional writer and lecturer. He is the author of the Cicerone guides, including the first version of Cycling the River Loire, The Danube Cycleway: Donaueschingen to Budapest and The Way of St James: A Cyclist's Guide. For the latter, he and his wife Andrea spent two years researching the pilgrimage before embarking on their cycle journey to Santiago de Compostela in 1997; they have spent much of their spare time cycling alternative bike routes ever since. They live in France only a few kilometres from the pilgrim route.